As part of the NIH Common Fund's Metabolomics Program, the Metabolite Standards Synthesis Cores (MSSCs) — RTI International and SRI International — aim to synthesize and provide compounds to aid metabolite identification and quantification in the form of stable isotope-enriched standards and derivatizing reagents that are not readily commercially available. Several compounds have been synthesized and are now available for shipment. Browse compounds that have been synthesized and are available for shipment. Request aliquots of available compounds. 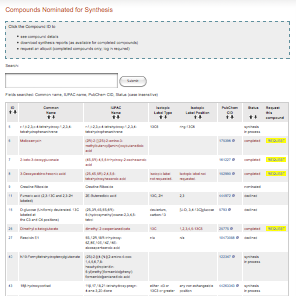 Browse all compounds approved for synthesis plus the complete list of compounds, including all nominations. Link to compound structure and detailed annotations. 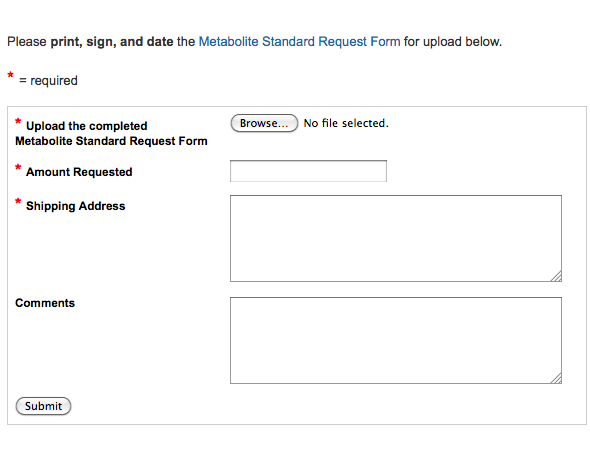 We invite you to send us your feedback related to metabolite reference standards and reagents.